A new report published today (Wednesday, 1 June 2016) by the ESRI finds that Ireland has not developed a system of labour market integration supports, tailored to the needs of refugees. Access by refugees to mainstreamed employment supports is unrestricted. However the provision of targeted integration measures is important because refugees can face specific barriers to participation, including: experiences of trauma, the absence of a social network, gaps in employment and education, and a lack of documentation hindering the recognition of qualifications by employers. The total number of people recognised or resettled as holders of international protection in Ireland increased by 29 per cent between 2014 and 2015, from 600 to 773. During 2015 Ireland undertook to further increase the intake of resettled refugees in response to the migration crisis in Europe. Refugees may access mainstreamed supports, including the Department of Social Welfare’s Intreo service, housing services, social welfare, vocational education and training on the same basis as Irish nationals. Admission conditions for certain services such as the Back to Education Allowance (BTEA) and the Community Employment (CE) Programme have been adapted to make it easier for refugees to participate. However, refugees in Ireland can face challenges in navigating the system of mainstream service provision. A targeted programme designed to help migrants to access employment, the Employment for People from Immigrant Communities (EPIC), provides specific supports including on CV preparation, mock interviews and individualised career guidance. EPIC is available but it has a limited intake, is Dublin-based, and is not targeted to the needs of refugees. A sub-group of refugees, resettled directly to Ireland with UNHCR, may access a tailored orientation and integration programme after arrival, covering topics such as: child protection, domestic violence, education and employment in Ireland. Although they are robust and targeted, these supports are not specifically employment-focussed. A similar targeted orientation and integration programme is not currently available to the majority of protected migrants, including those who come through the asylum system in Ireland. Protection applicants in Ireland may not work while their claim is being investigated and many refugees will have spent long periods in the direct provision system of accommodation. Refugees who come through this process can face problems transitioning from direct provision to independent living, including low self esteem associated with long-term unemployment, problems accessing private rental accommodation and gaps in employment history. “Access to employment is critical to integration, enabling refugees to live independently and to contribute, while increasing acceptance by the host society. The particular vulnerabilities of refugees mean that they are at risk of becoming lost in the system of mainstream service provision in Ireland. Integration of Beneficiaries of International Protection into the Labour Market: Policies and Practices in Ireland was authored by Egle Gusciute, Samantha Arnold and Emma Quinn and will be published on 1 June 2016, on the ESRI website. The embargo is 00.01, Wednesday, 1 June 2016. Beneficiaries of international protection, include Convention Refugees, Programme Refugees and beneficiaries of subsidiary protection. Persons granted leave to remain including for humanitarian reasons are also included within the scope of the study. Access to the labour market is set out in Irish legislation for Convention and Programme Refugees and beneficiaries of subsidiary protection and all three groups have rights equal to Irish nationals in relation to employment. The ESRI acts as the Irish National Contact Point of the European Migration Network (EMN). The aim of EMN is to provide up-to-date, objective, reliable and comparable information on migration and asylum at member state and EU-level (see www.emn.ie and http://ec.europa.eu/dgs/home-affairs/what-we-do/networks/european_migration_network/). 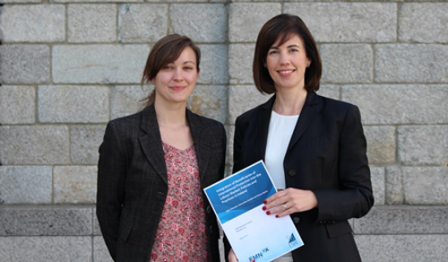 The EMN is co-funded by the European Commission DG Home Affairs and the Irish Department of Justice and Equality.